DAZ 3D is pleased to announce the public version of DSON Importer for Poser, version 1.1.3.50! The 1.1.3.50 version is a maintenance release and resolves some key issues discovered since the 1.1.2.117 General Release. In addition to specific fixes, this release is intended to maintain parity with the corresponding DAZ Studio General Release (4.6.3.50) where features and/or fixes are common. All new downloads of the DSON Importer for Poser product (SKU: 14897) will be of this version. A Change Log with additional information can be viewed online within the Documentation Center portion of our site. DSON Importer for Poser shares code with the DAZ Studio core, and so it is built every time DAZ Studio is built. Sometimes that means a build doesn’t have anything that should directly affect how the importer operates (i.e. additions, tweaks, fixes that don’t affect reading, writing, geometry, etc) but is part of the shared core, while other times it means something in the shared portion of code does affect it, or something specific to the importer in an unshared portion of code. Regardless, it gets built so that we can keep them synchronized, as that helps us (and you) keep track of which versions of the importer are intended to support content made in a particular version of DAZ Studio; assuming a given feature is supported. The last two numbers in the version (i.e. 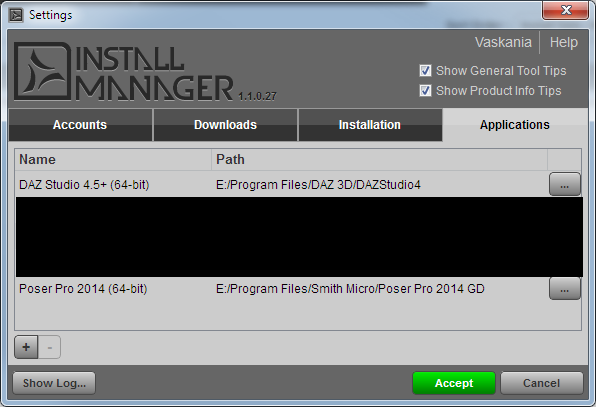 1.1.x.x) of DSON Importer for Poser will generally be the same as the current version of DAZ Studio. There can be exceptions, but they will typically stay in sync. If Install Manager tells you that there is an update, the version it provides is the current one, and thus the one you should be using to ensure the best compatibility with content in the DSON format. Has the Genesis Starter Essentials, or the Genesis 2 Female Starter Essentials, content packages been updated too? No, the "Genesis Starter Essentials" and the "Genesis 2 Starter Essentials" packages provided with the product have NOT been updated beyond what is currently available. *Note: Install Manager users are notified of product updates when they occur. If you have previously added the DSON Importer for Poser product to your account, launch Install Manager, log into your account and type "DSON Importer for Poser" into the filter field to filter out anything else. Then simply download and install as you would normally. Optionally, you can locate, download and install DSON Importer for Poser from the Product Library [once you are logged into your account] by entering "DSON Importer for Poser" into the text field near the top left of the page and clicking the "Filter" button, or by clicking here. Then, simply click the green "download & install" button to launch Install Manager with an appropriate filter or click the blue "download" button to download the standalone installer. Can I have the General Release and the BETA installed at the same time? The simple answer is... You should only have one version of the DSON Importer for Poser installed at a time. The more complicated answer is yes, but you can only have one version of DSON Importer for Poser installed per installation of Poser 9/Pro 2012, 10/Pro 2014. Poser 9 and 10 are only 32 bit, while Poser Pro 2012 and Pro 2014 offer the ability to install both a 32 bit version and a 64 bit version. I needed to select the approrpiate filters in Install Manager, before I got my notification. So I suggest users check their Filters setting inside Install Manager, and then they can see whether they need the update or not. just wondering...subdivision on props are not working? I have never used DSON and now I am working in PoserPro 2014 would like to try. Is there a clear simple tutorial available to walk me through its ins and outs? This DSON Importer for Poser rubbish is ridiculous, some king of monstrosity. I try now for 3 weeks to get it going. The recommendations from the support were useless. I can neither recommend the DSON Importer nor DAZ 3D! This DSON Importer for Poser rubbish is ridiculous, some king of monstrosity. I try now for 3 weeks to get it going. The recommendations from the support were useless! I can neither recommend the DSON Importer nor DAZ 3D. Which version of Poser are you using? Did you install the DSON importer scripts to the Python folder in the main Poser runtime? It is best to install any Python scripts there. When you installed the importer, did you make sure the DS4.x files installed if you do not have a copy of DS4 installed on your system. It's been a while since I used it but the original installer had a screen and check box to install the DS4.x files. It may be automated now. Once you install the importer, you need to install the Genesis Starter Essentials and it's Poser Companion Files to the same runtime. I've found the best solution to be a separate external runtime. Rather than use the DIM, download the files manually and install manually. Joe Public has a thread over in the Rendo Poser forums walking you through how to install the content. One of the main things you need to do with zip folders is move the Runtime folder that is inside the Content folder of the zip out of the content folder and let it behave as you would any other external runtime set up. Perhaps if you give as much detail as possible as to what the problems you are experiencing, someone can help you. Some more information about what you have done, and how it is failing, might enable us to help you. Neither assertion is true. I use the importer every day with no problem. Just relax and describe your problems here and let us help you. You are right. I am stupid. Therefore I use only programs that work well and are properly designed. DSON Importer doesn`t belong to this category. To get it working you need 2 other programs ( Genesis Starter Essentials, Genesis Starter Essentials for Poser) and despite this bulk of material it gives unsatisfactorily results. I don`t want to deal with technical problems. I want to concentrate on my 3D work. You don't need the starter essentials for the dson importer to work. You only need them if you plan on using Genesis because those are the Genesis content packages (same goes for genesis 2 female/male starter essentials packages). Just like V4/M4, if you don't want to use them, don't install them. What version of Poser are you using? The importer will only work with P9/PP2012 with SR3 or higher. The importer also needs to match the bit depth. If you're using Poser 64bit, use the 64bit importer, same for 32bit. Also, if you're installing with DIM, make sure you have your app paths set up properly (see image). Obviously your paths will be different. It's working well for me. The problem is not the Importer. Many thanks for your patience and friendly comments. I appreciate it very much. Hi folks, not real sure where to post this problem but since DSON is required to use the product in Poser, this must be a good place to start. I use PP2014 64 bit ver. 10.0.4.27796 with DSON importer 1.1.3.50 64 bit and when I am forced to use it DS 4.6.3.52 64 bit. I install only 64 bit versions of any software as I run only a 64 bit OS. I seem able to locate and load content with no problem at all. Until it comes to Genesis anything. Now, having just spent near $40 on Aiko 6 I need an answer to this problem. The PROBLEM: Aiko 6 and Victoria 6 seem to load almost instantly into Poser. Nothing shows though. It is invisible. In fact, the behavior of these Figures is exactly the same as V4 and M4 Figures right after installing but NOT running the DzCreateEXPfiles.bat. And I cannot find any such file to run for Genesis anything. HOW DO I get GENESIS to function in Poser Pro 2014? addenda: I installed all the Genesis 2 Male/Female Starter Essentials including Poser CF back with DSON Importer 1.1.1.33 as that is the version those came with. Am I supposed to reinstall all that stuff with every update to DS and/or DSON? You need to install both "Genesis 2 Female Starter Essentials" and "Genesis 2 Female Starter Essentials PoserCF", as well as both the main zip and PoserCF for Aiko 6 and Victoria 6.
sorry fixmypcmike, I was editing my post to add that I already DID install all that stuff. I reiterate: Do I have to RE-install all that stuff with every update of DS and/or DSON and/or Poser Pro ?? I also do not install any content for any program in my system drive. All of it goes to external Runtimes on other hard drives. No software I use has ever had a problem with that scheme. No, you don't need to reinstall the content. Did you install them manually or using DIM? If you installed manually, did you put the Data folder in the same folder that contains the Runtime folder? I don't use DS so never install the DIM. The way DAZ packages stuff now with EVERYTHING dumped into the CONTENT folder it's dicey deciding what to put in the Poser runtime, yaknow? I DID reinstall ALL Genesis thru Genesis2 content, Aiko 6 and Vicky 6 as well. THIS time I didn't move the only Runtime folder I saw. I copied it to my Poser folders and the rest I moved the entire CONTENT folder to well the drive and merged it with the existing CONTENT folder. Haven't tried it yet, will do in the morning! Thanks for the help! @fixmypcmike - OK, well, now I think I understand it. There is no EXP stuff per se, the Data folder has all the morphs info, and channels can be added to the Figure at will somehow. Before even copying some parts of the Data folder to the Poser runtime I added Poser\Content\Runtime to the Library in PP2014, then found the Daz People and Aiko 6 loaded with all her morphs AND her textures. I still make no sense whatever of the haphazard mess in the Content folder. Poser's strict adherence to the Right File Types in the Right Folders rule works to keep the folders tree cleaned up. It would appear that DS has no rules. Pity. The program COULD be useful IF it could find its own stuff. But I digress; I am loading Victoria 6 into Poser Pro 2014 for the very first time, and she was a freebie about a month or two ago. It works! Hey where are the expressions, face morphs and stuff? Yes, this is the first time I've really gotten to explore Genesis 2 in Poser. So, I am seeing all the Genesis stuff through the eyes of someone who has gotten to know all the Gen 1 thru 4 Figures. While the Base Figures look pretty darn good we still need to be able to individualize them. Where are the morphs now? In the Individual parts? The Content folder in the zip is just for organisation (since DIM can install stuff that isn't content). When you use DIM to install it will remove files from the Content folder and merge them correctly with the Poser external library you point it to. DIM is not tied to DAZ Studio. .... While the Base Figures look pretty darn good we still need to be able to individualize them. Where are the morphs now? In the Individual parts? Select the Figures Body after loading and go to the parameters tab (Pose Controls - Head - for Expressions). I don't know how much comes with the Genesis2Base ... probably as much as with V4, which is not much. @ Richard - Thank you Richard! So, two programs with two different names mean Content Manager and Install Manager are two very different things? I just tried to install the DIM while cancelling the install(s) of the CMS (cause it runs an unwelcome process continuously) and behold, nothing was installed! I will not allow DAZ to install a constant run process. Period. Does this Install Manager HAVE to have that? @ Kerya - after looking at the total lack of any shaping type morphs at all, I already put the Genesis 2 Female morphs bundle in the cart. These are a lot more expensive than the Gen 4 equivalents. They're gonna take a LOT longer to buy up. I just dl'd those free morph packs from ShareCG and found a lot more free Genesis morphs to go with those. They're at least worth experimenting with! Thanks for the input, Kerya! I noticed the above discussion with interest. There is a high level, experienced 3D Poser Artist like McG who has problems with Genesis! This supports my opinion that DAZ 3D with its Genesis stuff is much too difficult for Poser users. Especially for those who are not high leveled and with long experience. Poser is a programm that is understandable, clear and practicable and gives good results. DAZ 3D would sell much more of its Genesis stuff if it would be understandable, clear and practicable too. McGrandpa what is your opinion to this problem? I don't think you can install DIM without installing the CMS, but you can separately uninstall it if you wish (just remember that you would have to do this after future updates to DIM too - at least unless and until PostgreSQL becomes the default CMS instead of Valentina, since PostgreSQL doesn't run as a service anyway). If the content is installed with the default settings, using DIM, then all that is needed is to add the external library used to Poser - not something that should be grossly challenging for new users once they have started to install content. The content then loads from the Poser library just as non-DSON format does. My problem with Genesis is simple. I AM A GENESIS NOOB! Until I became totally enamored with Aiko 6, the newest iteration of the Anime Girl DAZ became famous for (really they did!) I had not spent anything ON Genesis at all. So why not? Also simple. I found myself in the same shoes that all the Gen 3 users were in on the day Victoria 4 was released. They discovered quickly that their (often obscenely large) investment in All Things Gen 3 (David, V3, M3, A3, SP3) was suddenly moot. Couldn't be used with Gen 4. That did change a little bit through the years, but not really that much. Not enough to be useful for them. So to this day there are people who have held on to and used their Gen 3 stuff and never bought much at all in the way of Gen 4. Well, l got my start right at the end of that heyday. I had bought A3, TY2, The Girl and The Freak, plus several of the free Figures from various artists. Those figures were a little easier to use, but this was the beginning of something new that DAZ created. Injection Morphs. It's a thing that opened up the world for 3D. They made a few mistakes along the way, but generally created something very useful. This is where Gen 3 started. Gen 4 (V4.2 etc.) was even better, and Genesis still uses a form of injection morphs but it is handled in a different way. It is actually easier in USE than all the previous issues. There is no external batch file to run, for example. Also it appears that I may be able to use my own considerable investment of Gen 4 stuff with the Genesis 2 Figures. Clothing AND Character sets. If so then DAZ have provided a hugely useful means of transition to Genesis from Gen 4. I now want to look into that more. The DSON importer wasn't that easy to get going, not at first. Fast forward a couple years from that point and, even on the same exact rig and OS, even using the same content drives and folders, the DSON Importer for Poser is easier to get going AND everything it 'sees' that is DS only are seamlessly displayed and used in the Poser Library. The 'Old' formats might not supported. I have yet to even try them. If they ARE than I can load my old old DS 1, 2 and 3 scenes and poses right up in Poser. So here I am just barely beginning with Genesis, and it's jumping right to Genesis 2 and in one evening installed and loaded a couple of Genesis 2 Figures right up. It should NOT be surprising the problem I had was a simple one. Here is one thing that might surprise the DAZ PTB's: They made it impossible for a POSER user to FIND the documentation and load it for a users newly installed items. So I was going by guess and by golly doing it without use of any docs! Yes I *AM* a Poser user by choice, yes I also keep a fully functional DS 4.6 Pro installed and runnable. My personal preference for MY use is Poser Pro. This being said, DS is seeing wide use, uses ALL DAZ content and it is free. Any person will have to weigh the pros and cons of each software package and choose for themselves. McGrandpa,thanks for this detailed and likeable comment( oct-05-2014). You are full of hope and optimistic that everything works well with Genesis as you want it. I keep the fingers crossed for you. As for me: I do not dive into all this problems with Genesis for Poser without knowing the final result. And I refer to the comment of Richard Haseltine: "For users of Poser 9/PoserPro 2012 it is possible to use the CR2 exporter in DAZ Studio to send Genesis to those versions of Poser, though there are feature limitations compared to the way Genesis performs in DAZ Studio 4." Of COURSE there are differences, they are different programs that do similar things in quite different ways. I think the end question ought to be "Can I get what I need to with it?" The most probable answer I can give at this point is "Mostly yes". PP2014 has a nice set of features for fitting things to figures more easily than in other versions. I spend time in the Materials Room and have come to enjoy that time. I don't enjoy Dynamics in any program. I now have a FITTING Room and also a Morph Brush in the Preview Room plus some new options in the Settings and Options tabs that help fits. As it is that is my only concern at this point. Cause the Figures DO load into Poser with whatever morphs are INSTALLED with the Figures intact. THAT is the key operational difference between Genesis and all earlier Figures. You don't use the EXP system now. It's a powerful difference. Anyway, as my learning progresses I will update you. BTW, so far, Genesis is a lot easier to use than the Gen3/4 stuff with installing morph packs, running the CreateEXPfiles batch which creates the new morph channels in the Default Figure. That is taken care of when the morphs are installed. It means the next Genesis/2 Figure loaded will have all those morphs automatically. Yes there are certain feature limitations. Plugins exist for DS that allow you to shape shift through the entire range of loaded morphs, taking it from the ridiculous to the sublime. Poser doesn't have that. BUT Genesis Figures still load with all the morphs. No matter which program is used.